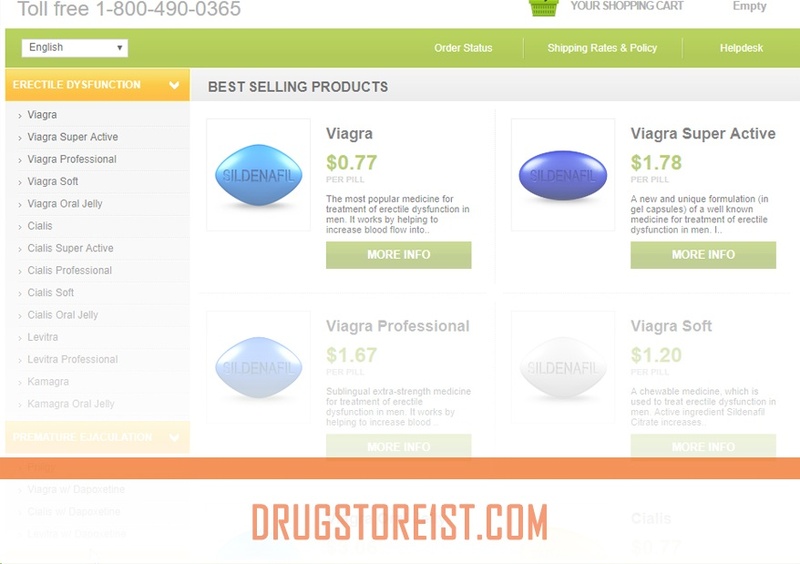 Drugstore1st.com is an online drugstore that focuses only on solving males’ sexual dysfunction issues. The pharmacy has been online since 2008. There is no information available on the drugstore site about its location. However, the pharmacy indicates that it has already managed to offer its medications to more than 150,000 customers in the span of the one decade it has been online. If this number is real and not faked to impress buyers, the pharmacy has achieved a great feat. The pharmacy catalog consists of generic erectile dysfunction medications. All its medications have their origin in Indian pharmaceutical companies. The pharmacy is affordable. It is over 95% cheaper than the local pharmacies which stock brand ED medications. The generic Viagra pill will cost any buyer $0.77. Generic Cialis is sold at the same price as generic Viagra. It costs buyers $0.77. Levitra is the most expensive among the three main ED treatments being offered by Drugstore1st.com. The price for a pill of Generic Levitra is $1.78. All medications are delivered via Express delivery. The buyers have to wait for their meds for only a period of 5 to 9 days. This method is trackable. This means that buyers have the ability to know where their medications are at all time during the 5 to 9 days the medications are being shipped. If buyers are to pay for this shipping method, it would cost them $29.95. However, the pharmacy does not ask for any shipping fee. All medications are shipped for free. It does not matter the amount of money a buyer is paying for his or her medications. The pharmacy accepts payments via cheque, Mastercard, and Visa. Paying with either Mastercard or Visa would have been appealing to me. Both of these credit cards could have allowed me to dispute any charges made to my card if Drugstore1st.com failed to deliver the ED pills I had ordered. Drugstore1st.com indicates that it would reimburse the buyer in case his or her medications fail to reach him after 30 days since the first day they got dispatched. The store, however, indicates that if the drugs failed to reach the buyer because he or she had input the wrong address, the pharmacy would not reimburse him or her. Buyers are only allowed to cancel their orders within the first 12 hours since the time they first placed the order. After receiving a product, Drugstore1st.com does not allow their buyer to return medications in order for them to be refunded. The drugstore claims that they cannot be sure the products were stores in a great place and under perfect conditions. The pharmacy has reviews on external websites. The likelihood of these testimonials being real is very high. The pharmacy users had mixed reactions. Some of the buyers got scammed while others received their products without any issues. 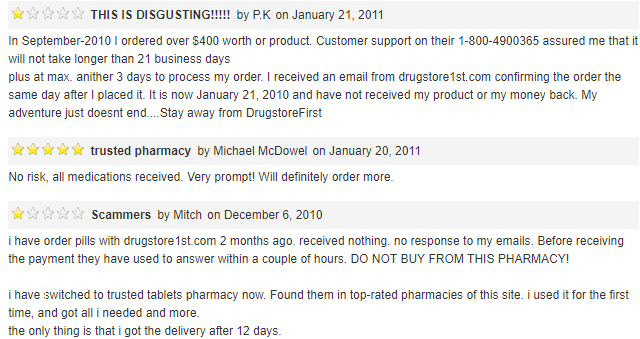 I decided to capture some of the reviews available online for Drugstore1st.com in order to make sure you saw them. P.K. ordered medications from Drugstore1st.com worth $400. The customer support department assured him that the product would not take longer than 21 business days before reaching him. The support agent also informed him that three extra processing days would be needed. He got an email from Drugstore1st.com confirming the order after he had placed it. P.K. reported that it had already been over 4 months and his $400 package was yet to arrive. He had not received his money back either. He encourages people to stay away from Drugstore1st.com. Michael reported that he ordered pills from Drugstore1st.com and received the medications. There were no risks and he would order more. Mitch reported that he ordered medications from Drugstore1st.com and he did not receive the pills. The pharmacy refused to respond to his emails. Before he paid for the meds, the drugstore customer support department was replying to all his emails within a couple of hours. He decided to switch to another pharmacy. The above reviews make Drugstore1st.com look fake. The drugstore responded to the customer’s queries in order to encourage him to pay. After he had made his payment, the drugstore stopped communicating. This shows their main goal was to rip him off. The reviewer above reported that he received his package with all the drugs he had ordered inside. He advised buyers to always order at least 2 to 3 weeks in advance. The medications took 15 days to arrive in the US. The medications delivered were great. Tracking worked perfectly until the meds arrived in his mailbox. The drugstore offers their buyers a chance to not pay for the shipping. Also, every buyer gets 4 free bonus pills. Checking the price for a pill when a buyer purchases 360 pills and the price for a pill when the same buyer purchases 10 pills, you will notice that Drugstore1st.com offers bulk buying discounts. Purchasing medications at Drugstore1st.com appears to be relatively risky. Some buyers reports being scammed while others received their meds. 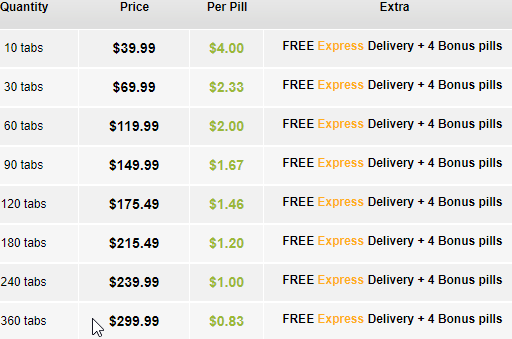 By ordering ED pills from Drugstore1st.com, you might get lucky and receive meds or receiving nothing at all. The pharmacy has nice prices. Also, it has numerous alternatives men suffering from erectile dysfunction can choose from. The fact that Drugstore1st.com lacks any other medication on its catalog except ED pills is not attractive. It will not cater to the needs of many people.